Claire Bishop’s essay The Digital Divide appeared in the 50th Anniversary issue of Artforum (Sept. 2012) dedicated to New Media and was reviewed for WWR and CAP’S CRITS. It was one of the sillier contributions and did not merit mention where concern was firstly with the assumption that medium provided an adequate platform from which to assess progress or development in art. Elsewhere, The Digital Divide drew objections even from those committed to New Media. In the January 2013 issue, Artforum published a letter from Lauren Cornell and Brian Droitcour, a curator and critic of New Media (p.36) in which they disputed the crucial division between digital and older art forms alluded to in the title of Bishop’s essay and pointed to glaring deficiencies in its grasp of visual art. Their letter was wryly titled Technical Difficulties . Bishop replied that her essay was not ‘about new media or digital art’ (p.38) but about the mainstream – understood as the more prestigious galleries and regular international surveys for contemporary art – and its ambivalent attitude toward digital technology, a deep division within it. How she can examine this thesis without indicating what digital art entails and offering pertinent examples is unexplained. Indeed, she is happy to acknowledge that this is beyond her expertise which again begs the question of why she would then title the article The Digital Divide, when she is unqualified to consider what lies on one side of the divide, yet qualified to discuss the other, erect such a distinction in the first place. It is a frankly disingenuous excuse. But since Cornell and Droitcour directly challenge the integration between digital and pre-digital means in the mainstream, it hardly lets her off the hook in any case. She simply fails to address their assertion about growing acceptance for digital art in the mainstream. Her reply does not address the issue of visual art at all. It is worth considering the essay and its controversy in more detail here in order to appreciate why this issue of visual arts is ultimately fatal to the cause of The Digital Divide since it also serves to clarify the standing of prints of all kinds against works of single instance in art. Firstly however, it is worth noting that the bulk of her response restates her criterion for significant work in digital media that ‘reflects on what it means to think, see and filter affect through the digital’. Unable to defend a strictly digital divide within the mainstream, she changes tack to maintaining a deeper and more relevant engagement with digital means. Indeed, toward the end of her response, the criterion acquires social and political dimensions. The trouble is her examples of Frances Stark and Ryan Trecartin then look especially frivolous. Rather than walk us through the unsuspected depth to these exceptional figures, Bishop compares Vito Acconci’s use of video in Theme Song (1973) with Thomas Hirschhorn’s Touching Reality (2012). The former supposedly offers new scope for narcissism and intimacy with the availability of relatively cheap portable video cameras and Sony’s U-Matic tape format by the early 70s, while the latter purportedly demonstrates a detached and passive consumption of photographs of war atrocities via an iPad in 2012. But crooning improvised songs with faltering conviction into a video camera is not much more than clowning in one’s private photographs, doing funny voices into a tape recorder. Yes, the means allows some slight advance in self-indulgence, but whether this strictly equates with television, as she suggests (they may both need a monitor but signal sources are radically different, and, as the name tele-vision hints, distance is everything) and whether this is really an accurate description of Acconci’s performance, are quite another matter. Video was an important means of documenting artist performances in the late 60s and 70s, of crucially dividing the work between a performance, private or public, and its record, in some cases against a plan, script or score, but to treat it as simply endearing self-indulgence with a porta-pak is a mistake. What feelings and perceptions are involved here depend upon correctly identifying the work’s stylistic context. Bishop does not. Hirschhorn’s six-minute silent video on the other hand, is not concerned with performance or documentation but a laboured metaphor for alienation. We have no way of knowing whether the source of the picture is online or off, distant or present. The hand touching the screen does not activate buttons or links there but simply drifts or pauses briefly on details of terrible mutilations. We really have no way of identifying the pattern to these gestures. It may be someone who simply misunderstands the terms of interactivity. It may be an expert indicating cause or sequence to the bloodshed, it may be a witness trying to identify victims or their parts, it may be a disinterested user puzzled by imperceptible (for the viewer) screen dust or stains; it may be a psychic making mystic connection with the dead. The work is ‘touching’ in its intangibility. But whether this can be said to truly reflect ‘on what it means to think, see and filter affects through the digital’ is again, far from conclusive. The niceties of interpretation, the nuances of feeling are clearly not Bishop’s strong suit either. But the problem is firstly the terms on which she chooses to characterise something as sweeping as digital technology in art. The Digital Divide’s preference for video quickly emerges in the essay, although no justification is offered. Digital still photography and graphics are acknowledged (3-D modelling and animation ought to have been) but for some reason these are not quite digital enough for a criterion of excellence that demands the work ‘thematise’ radical changes in ‘perception, history, language and social relations’ (p.436). What are these changes exactly? Certainly the internet has allowed easier access to all kinds of information, and to promptly contribute or contest some of this. Certainly it allows greater integration between still and motion pictures, graphics and animation and compositing with live action. Whether this in itself has generated significant changes in language, feeling and behaviour however, is doubtful. These things are forever changing after all, are influenced by all users and activities. A list of fleeting slang for example will hardly be sufficient. But even where the criterion is laudably correct or worthy, it is simply not the kind of programme that generally inspires artists. It is a cultural policy rather than an aesthetic. Artists like Trecartin or Stark proceed not from some careful sociological analysis but from their own circumstances and enthusiasms. They adapt technology to long standing inclinations, obvious traditions. To look for this daunting criterion in art, digital or otherwise, not surprisingly discloses few convincing examples for Bishop, or as she acknowledges in her response, others that dispute her findings. The criterion itself is useless as a measure of feeling or engagement, within or without the mainstream, merely reduces art to social document. In attempting to frame contemporary experience in terms that thematise or grant prominence to digital technology, The Digital Divide ultimately betrays its own triviality and indulgence. Issues like unemployment, poverty, government corruption, street crime, extreme weather and homelessness are not to be felt fully or firstly in terms of digital means. Even in terms of relationships the core issues remain face to face, in the flesh, whether understanding a partner, getting one’s children off to school or tending the aged or infirm, digital is not really the point. Life demands more of us than merely attending to our screens. Our screens only really count when we care most about their content. To presume that the internet has drastically influenced language, perception and feeling is to infer a life lived in sterile isolation, where one might download vast numbers of files in the interests of vital research perhaps, or idly refresh one’s music library, but where language and perception connect with nothing more than a gadget. While the digital world has its share of influence on language and attitudes, it is not the whole story, in some cases not even part. The sweeping nature of the criterion finds its counterpart in the analysis of the mainstream’s abiding concerns. The Digital Divide lists seven trends that supposedly become dominant from the nineties onward. They are ‘performance, social practice, assemblage-based sculpture, painting on canvas, the “archival impulse”, analogue film and the fascination with modernist design and architecture’ (p.436). The trouble is all or most of them were also prominent in the preceding decades going back to the sixties at least, in the case of painting on canvas, going back to the fifteenth century. There is little if anything to distinguish them as typical of the nineties or after, without extensive qualification. On this point alone it is hard to regard the essay with anything but open ridicule. It underlines the folly of proceeding strictly according to medium or technology but also points, as Cornell and Droitcour note, to a disturbing blind spot, not simply in accurately discerning mainstream fashions, but complying with the basics of art history. Presumably, art history also falls outside the author’s brief here. The argument is that these trends each reflect the subtle influence of the digital revolution but at some level (it is not clear whether it is administrative or artistic) they deny its full potential. The trends are thus essentially nostalgic or evasive. The trend to small gauge film and slide projections as installations, arises somewhat later in the nineties but can be plausibly viewed in light of digital replacements, in as much it is only then that they allow comparison with picture quality, and the distinctive warm grainy quality to low gauge film is more widely discerned. It is not that these antique qualities cannot be easily replicated by digital means, as Bishop notes, but that the entire mechanism of projecting strips of celluloid, its distinctive noises, even its smell, become a kind of sculpture when suitably displayed. Perhaps the reason for this is that once the technology has been superseded, attention is no longer so strictly upon pictorial content, so that surrounding factors then take on a curious framing or expressive function, inflecting the picture. The films then assume a more process-based meaning. Bishop ponders why some such reaction did not greet the introduction of VHS recording replacing home movies (p.437) but video tape never really threatened to replace film at an industrial or commercial level because of inferior picture quality and difficulties in distribution or formatting, so that video initially provided an alternative rather than comprehensive substitute. In the case of the trend to installation and site-specific performance (so-called social practice or social sculpture) to the extent that there was one in the nineties, works unquestionably deal in audience participation, in shared food and other smells, in tactile engagement and site modification, all qualities in striking contrast with interaction via the internet. Although the internet at this time was only in its infancy. Whether these differences can truly be said to thematise contact outside of the web is doubtful, given they follow a steadily expanding practice for installation and performance dating back to the sixties. The supposed trend to assemblage in sculpture in the nineties builds upon a tradition stretching back to the nineteen twenties. The obvious candidate for a sculptural trend in the nineties would surely have been commissioned or fabricated works by the likes of Jeff Koons, Damian Hirst, later Wim Delvoye, Tobias Rehberger and Santiago Sierra amongst others. We might call this the Readily-Made. Where assemblage is maintained at that time, Isa Genzken is a puzzling choice since her work at the start of the nineties ranges between austere but modestly scaled Minimalism and the fabricated large Rose (1993). It is not until the early noughties her work properly engages assemblage. The argument in The Digital Divide is that this brand of bricolage ignores or conceals preceding identities or functions for elements, while later versions such as the work of Carol Bove and Rashid Johnson repurpose elements or maintain some of their previous identity. But this assumes a rather rigid identity for potential elements, overlooks the fact that one can easily identify elements such as furniture and clothing in Genzken, in fact only understands her rearrangements on these terms. The difference between a Genzken and a Bove or Johnson is not a matter of repurposing versus some more formal or abstract assembly, but in range of elements, emotional pitch or expressive temperament. The argument is intent upon linking repurposing in assemblage with practices of reformatting and ‘transcoding’ digital files, straining after some latent influence. But repurposing does not reformat or adjust an element’s fittings or file type. It uses the element for a different purpose as it is – just as Genzken’s work does. The argument then shifts to revising rather than starting from scratch, but this is naïve, given the long tradition of assemblage, given that no artist re-invents the wheel. Even abstraction only retreats to point, line and plane. The ‘archival impulse’ takes its cue from Hal Foster’s essay in October – ‘An Archival Impulse’ (110, Autumn 2004:3) and allegedly follows on from the urge to collect or assemble. Foster argued that categories in such archival work are deliberately diffuse or obscure, calling for ‘human interpretation’ (a rare kind presumably, amongst Octobrists) rather than ‘machine reprocessing’. Bishop glosses this as a distinction between subjective and technological and completely traduces Foster’s difference between consideration and computation, between a strictly rule-based system and one depending upon diffuse and analogue resources. It need not be subjective, need not be technological. Catalogues and categories precede computers. The essay never does get around to the trends of painting on canvas and modernist design. Instead it loses its way in a morass of speculation concerning Walter Benjamin’s notion of aura, on permanence of works, interaction, authorship, the primacy of language, text and legibility, consumption and comprehension. None of it helps explain why the list of trends prevent digital videos of profound sociological insight achieving greater recognition or what the mainstream stands to gain from ignoring such work. The rambling only reveals further flaws in the author’s grasp of digital technology, indeed, powers of reason. 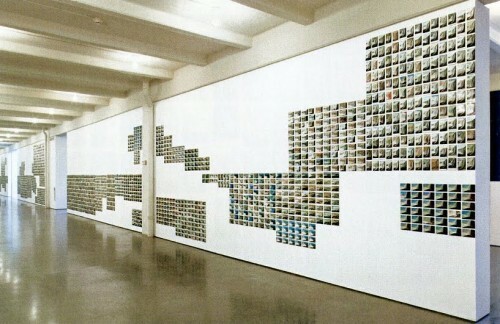 For example, discussion of Zoe Leonard’s You see I am here after all (2008) claims that it is impossible to take in the display of four thousand postcards at once (p.440). Yet viewers prepared to stroll a little obviously did take them in at one visit and the accompanying photograph plainly illustrates where one might stand to appreciate just what patterns or shapes to the whole are available. But to suggest that any work is fully taken in at an instant or belongs entirely on one plane is absurd in any case. It looks like Bishop does not do common sense either. Similarly, she claims the vast assembly attests to an internet advantage, and while the artist sourced most of the postcards from EBay, nothing in the work announces or depends upon this. Equally troubling is the claim that the digital is code ‘inherently alien to human perception’ (p.441). Again, this is naïve. Perception proceeds by training and experience. Appeals to mythic intuition only blind perception. The essay then goes on to assert that the digital is firstly a linguistic model because it allows one to convert a JPG to a TXT file, in which the picture is then rendered as a stream of numbers and letters. This is just embarrassing. The digital, as the name gently suggests, is a numeric or mathematical system. Low level binary code can eventually ascend to programming that builds applications like Notepad that deal in text files or applications that deal in image files such as JPG, TIFF, Bitmap and so forth. But opening a JPG in Notepad or similar does not demonstrate that one is more fundamental than the other, merely the flexibility of the application. In an essay promoting the digital this is pretty much a credibility killer. The essay concludes, ‘At its most utopian, the digital revolution opens up a new dematerialised, de-authored and unmarketable reality of collective culture; at its worst it signals the impending obsolescence of visual art itself’ (p.441). But there is nothing to suggest that the digital is any less material than the analogue, or does not require objects, that these do not have makers or authors, that there is not a market for either software or hardware, and that any of these imply the obsolescence of visual art. On the contrary, even casual acquaintance with the digital world reveals a very brisk trade in products and services, in some cases in the interests of fine art. It is the fate of visual art in this conclusion that prompts Cornell and Droitcour’s request for detail. But ‘visual’ is actually a little broad here, since literature and the performing arts also trade in sight. ‘Visual’ art should be understood as basically fine art, and for our purposes, pictures, not just paintings, although these are a vital category, but for all kinds of prints, or works of multiple instance, including digital video. The real sticking point to The Digital Divide is the derivation and value of pictorial meaning. This looms as not just a blind spot but a black hole in the essay’s arguments. The reason works of a single instance, such as paintings or drawings, tend to carry higher critical as well as market value, is because their meaning rests upon richer, more rewarding means. They are free to devote more of their properties to a two-dimensional scheme deciding form and content because they do not have the constraint of strict duplication or derivation to their purpose. A work of single instance is thus free to trade in texture or facture, all manner of applications of all manner of pigments, their chances, aging or distress, imposing size, irregular shape, elusive pentimenti, support or surface, subtle glazes, exceptional gloss and/or matt finishes, even location, framing or presentation (particularly for murals). All may contribute to a pictorial scheme that is then only to be discerned through comparison with other works. Such comparisons are rarely direct or explicit, cut and dried, comprehensive or uncontested. The process is analogous and analogue. We discern affinities and contrasts across a wealth of sources, stylistic features that allow us to find expressive, literal and metaphorical content. It is frustrating but fun. This is the engine room for new or striking styles of picture, new or compelling categories of subject. This is where optimum versatility is required. A print confines this versatility to schemes of efficient duplication. Where many instances allow a work to circulate widely, a scheme gains in acceptance and authority. This eventually allows some print schemes to set standards for realism. But whether factual or fictive, widely used schemes with great numbers of instances eventually generate expertise and curiosity about others. There is in this sense a circulation or economy to changes in schemes, expansion of means. Obviously advances in photography, lithography and graphics software allow finer, stricter duplication, but cannot equal or obviate the work of single instance. Impressive densities to tone screen dots or pixels, for example, might faithfully duplicate many of the qualities vital to a work of single instance, but it must still conform to pixel or dot grids, ultimately join a familiar scheme and so surrender opportunity for more diverse derivation. It never has as much room. But the virtues of conformity and sheer quantity have their uses, as noted, their realism. They not only ensure the facts of the world but may also sample and express their authority in this. The printed picture thus often enjoys the same prestige as the printed word and for similar reasons. But rather than accept a mystic aura to this, we do better to point to the sampling of initially less obvious qualities to the given scheme. Photographs in particular are often taken as more realistic or authentic for having a stricter derivation to scheme. Additional qualities such as the glossy or textured card to family snapshots, the crude tone screens to newspapers or pamphlets, may however, come to symbolise a conformity and integrity to scheme, that prompts faith in rendered subjects. The point here is that print may have an aura of its own, rather than merely being denied that of the work of single instance. Walter Benjamin’s noted anxiety about the status and prospects of the work of single instance, and for fine art in general, rests upon a misunderstanding of the relation between works of single and multiple instances and indeed the function of art. This small digression hopefully allows us to see an essential duality between the digital and analogue, to be reassured that advances in one hardly threaten the other, merely adjust its scope. The Digital Divide fails to appreciate this, can only circle the topic of contemporary painting warily, discrediting it as market manipulation, obstinate and inadequate tradition. But it is tradition rather than some fixation with objects that finally frames art, enables us to answer wayward questions such as ‘Does work premised on a dialogic, prosumer model, seeking real-world impact, need to recognise representation or an object in order to be recognised as art? (p.437). To cut to the chase, the answer is if as fine art, yes. But better questions would be why should such work need this recognition? Why are politics not enough? This article also appears on CAP'S CRITS.